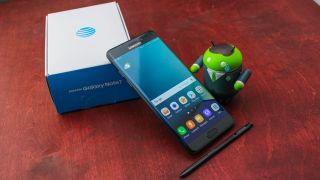 You won't be able to get a new Samsung Galaxy Note 7 from AT&T or T-Mobile when you exchange your old, potentially explosive Note 7, as the replacement phone could be just as hazardous. AT&T and T-Mobile are the first major US carriers to stop swapping out the Note 7 for so-called "safe" versions of the Android phone. This follows a week of scary reports that the battery can still catch fire. "Based on recent reports, we're no longer exchanging new Note 7s at this time, pending further investigation of these reported incidents," said an AT&T spokesperson told The Verge. "We still encourage customers with a recalled Note 7 to visit an AT&T location to exchange that device for another Samsung smartphone or other smartphone of their choice." T-Mobile, always echoing AT&T but always with a better deal, issued a similar statement saying, "T-Mobile is temporarily suspending all sales of the new Note 7 and exchanges for replacement Note 7 devices. "Anyone who returns their recalled Note 7 will automatically receive a one-time $25 credit on their T-Mobile bill within two bill cycles." Samsung hasn't issued a second recall for its troubled smartphone, so it's significant (and confusing) that AT&T and T-Mobile are the first to halt sales of the Galaxy Note 7. The South Korean phone maker simply said it's reviewing the matter. "We are working diligently with authorities and third party experts and will share findings when we have completed the investigation," Samsung said in a statement to TechRadar. "Even though there are a limited number of reports, we want to reassure customers that we are taking every report seriously. If we determine a product safety issue exists, Samsung will take immediate steps approved by the CPSC to resolve the situation." You can (and should) still take your Samsung Galaxy Note 7 into AT&T, T-Mobile or whichever store you got it from and get a new phone. You just can't get a new Note 7 if it's from AT&T or T-Mobile. Replacement phones can include the Samsung Galaxy S7 Edge, but now you aren't limited to a Samsung handset. You can even swap out a Samsung for an iPhone 7 Plus, much to Apple's ongoing delight. Of course, the cost of your replacement phone may differ from that of the original Note 7 price. The S7 Edge is cheaper, so make sure you get some money back. iPhone 7 Plus is more expensive, so just mosey on out of there if the AT&T or T-Mobile clerk doesn't say anything. What's a shame is that the Note 7 is a powerful, well-designed phone... outside of the exploding. That's a stigma that's going to follow Samsung around for a long time. Just when Samsung had another hit phone on its hands for 2016, the original recall broke right before the iPhone 7 launch. The new recall is happening as the Google Pixel and Google Pixel XL go on sale.